Albus lupin (Lupinus albus) has been grown commercially in WA since about 1982, when the variety Kiev Mutant was released. The area of crop increased rapidly during the 1990s, reaching a maximum of about 40 000 hectares in 1996. 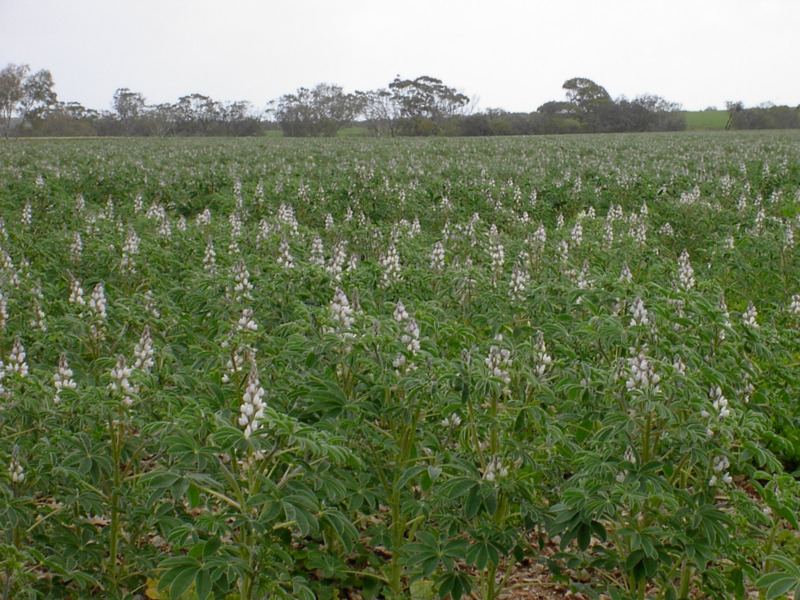 After the outbreak of the disease anthracnose (Colletotrichum lupini) in WA, a moratorium was placed on the cultivation of albus lupin because of its extreme susceptibility to the disease. The moratorium has subsequently been lifted and Andromeda, which has improved tolerance to anthracnose, offers an alternative Kiev Mutant. Andromeda is a variety of albus lupin with considerably better tolerance to anthracnose than Kiev Mutant. It allows albus lupin to be cultivated in the medium rainfall zone without the risk of serious loss from disease. Andromeda should not be grown in regions receiving high rainfall where blue lupins (Lupinus cosentinii) are common. Blue lupins carry anthracnose and the chances of infection are greater where rainfall is high. Andromeda does not have sufficient tolerance to allow production without risk of substantial yield loss in these regions. Potential yield of Andromeda in medium and low rainfall areas of WA is not as high as Kiev Mutant because Andromeda flowers about 7-10 days later than Kiev Mutant. Nevertheless, Andromeda will yield more than Kiev Mutant in most situations because of its improved tolerance to anthracnose. Growers with experience in growing Kiev Mutant before the arrival of anthracnose can expect Andromeda to produce about 90% of the yield that Kiev Mutant produced in the absence of anthracnose. The large seed size of Andromeda (slightly larger than Kiev Mutant) results in a longer grain filling period than narrow-leafed lupins. Hence, it requires a good moisture supply during the spring period. Andromeda is best suited to areas receiving about 350-400mm annual rainfall. Good results can be obtained in drier areas in favourable seasons on soils with a good moisture holding capacity. Andromeda is well suited to the fertile loams or clay loams that occur in valleys throughout the state and the red soils of the Mingenew, Mullewa and Morawa regions. It will not grow well in infertile sands or duplex soils. Andromeda is adapted to soils of slightly higher pH than is narrow-leafed lupin, but will not grow well on loams and clays with a pH above 7.5 if these soils become saturated with water. Dress seed with Thiram® and iprodione or procymidone to help control anthracnose and brown spot. If the paddock has not been cropped to lupins (any lupin species because they all utilise the same rhizobium species) in the past three years then also inoculate seed with rhizobium. Use granular inoculum rather than peat inoculum because fungicide seed dressing will kill rhizobia that are spread on the seed. If using peat inoculum that is spread on the seed then minimise the time the inoculant is in contact with the fungicide. Apply the fungicide first, ensure that it is completely dry, and then apply the inoculant. The seed must be sown into moist soil within six hours. If more than six hours passes, apply a fresh batch of inoculum. Andromeda will respond well to early sowing. This is because it flowers about 7-10 days later than Kiev Mutant. Crops that are sown early, flower early and have a greater chance of experiencing cool moist conditions during grain filling. Trials quantifying the yield penalties from delayed sowing of Andromeda have not been conducted. They are likely to be higher than for modern narrow-leafed lupin varieties and Kiev Mutant. 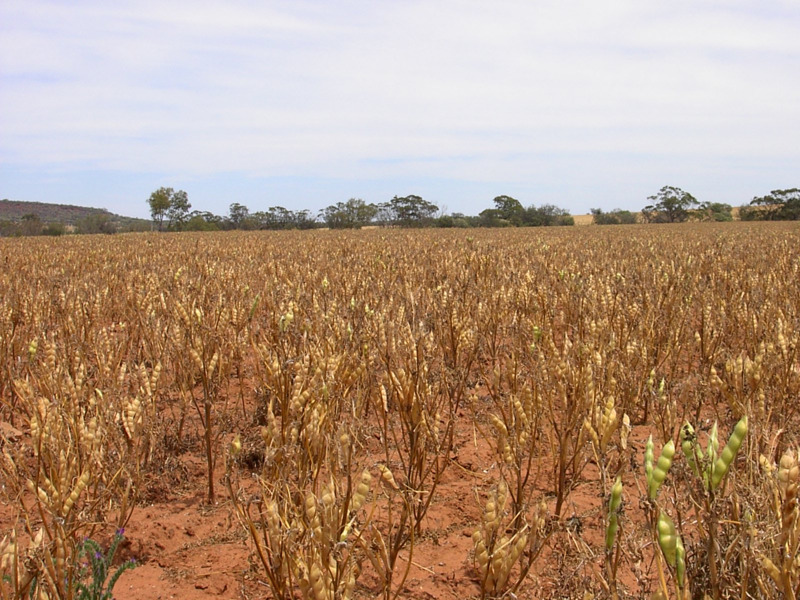 In the northern agricultural region crops sown after the third week of May in medium rainfall regions, or after the first week of May in low rainfall regions, are unlikely to produce acceptable yields in most years. Do not sow Andromeda into dry soil because it is very sensitive to late establishment. Once a crop is sown dry, there is no control over its time of establishment. Weeds will also be very difficult to control and the emergence of the crop may be patchy and uneven. Aim to establish about 45 plants per square metre. This requires more than 150kg of seed per hectare. Actual seeding rate will depend upon the seed size and germination percentage. Sow seeds 3-5cm deep. Take care not to sow too deep because emergence of seedlings declines sharply with deeper sowing, particularly on soils that form a crust. Use coarse metering wheels on air seeders, if available, to avoid cracking seed. An agitator in the seed box will also help seeds flow smoothly. Albus lupin seeds are flat and squarish and tend to pack down and flow poorly if not agitated. Andromeda requires less phosphorus and manganese fertiliser than narrow-leafed lupins. This is because albus lupins are good at extracting these nutrients from the soil. They form cluster roots (sometimes called proteoid roots) that excrete organic acids (mainly citrate) that solubilise soil-bound nutrients such as phosphorus, manganese, copper, zinc and iron. Some native plants such as banksia, hakea and dryandra increase nutrient acquisition in similar ways. A soil test will provide a guide to the level of phosphorus fertiliser required, but be aware that test results will likely be based on the requirements of narrow leafed lupins. Band fertiliser 5-8cm directly below the seed or drill it with the seed. Be aware that drilling high rates of fertiliser with the seed can be toxic to seedlings in some circumstances. Fertiliser placed with the seed in dry years when narrow tines have been used in notill cropping has reduced seedling emergence, crop density and grain yields. Do not top dress phosphate fertiliser because most of it will remain unavailable to the plant. Responses to potassium fertiliser are unlikely when Andromeda is grown on the loam and clay loam soils to which it is well suited. Nitrogen fertiliser is not required for well nodulated crops. Small amounts of nitrogen fertiliser (10-15kg/ha) may stimulate the early growth of plants but are unlikely to increase grain yields. If 10-15kg/ha of nitrogen is applied as part of a compound phosphorus fertiliser such as DAP (Diammonium phosphate) it will not inhibit nodulation. Commence harvest when the pods turn yellow and the seed moisture is about 14%. Do not delay harvest even though pods are unlikely to shatter or shed. This will ensure seeds remain undamaged and are of high quality. Andromeda generally matures later than Kiev Mutant or most modern narrow-leafed lupin varieties. A guide for harvester settings is given in Table 1. 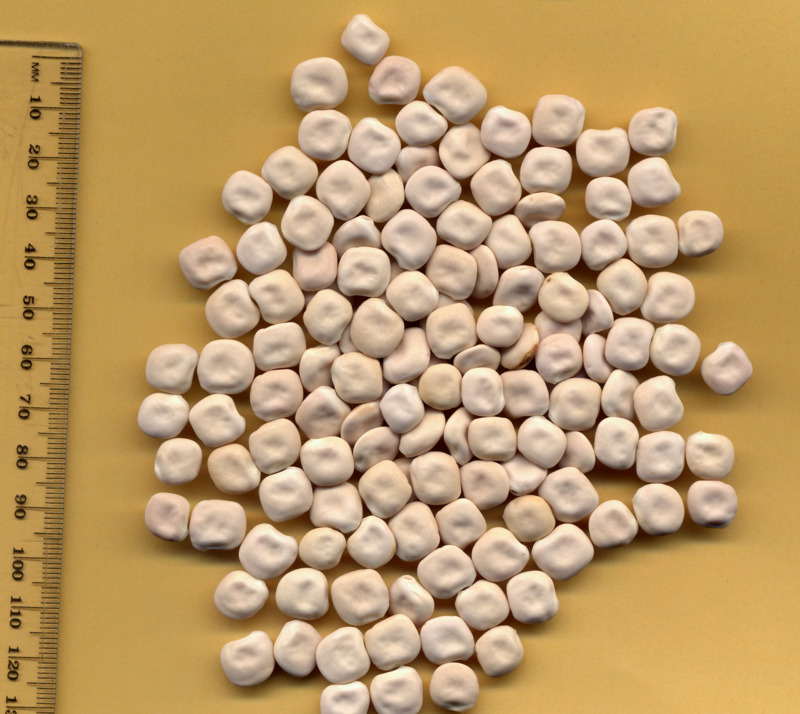 Use wide wire concaves or remove alternate wires of a cereal concave because the seeds are large. Start with the closest concave clearance and the slowest drum speed. Increase concave clearance if seed is being cracked. Increase drum speed if seed is left in the pods. Remember also to handle seed carefully after harvest to avoid damage. Table 1 Suggested harvester settings. Dr Bevan Buirchell made the initial cross for Andromeda in 1997. Parents are an anthracnose resistant land race from Ethiopia (P27175) and the well-adapted but highly susceptible WA breeding line (89B10A-14). Drs Kedar Adhikari and Bevan Buirchell selected Andromeda from the progeny of this cross through a combination of glasshouse and field screening under severe disease pressure. The Grains Research and Development Corporation (GRDC) and the Council of Grain Growers Organisation Ltd (COGGO) supplied some of the funds for this work. About 30 000 tons of albus lupin are exported annually from Australia for use as a snack food in Mediterranean countries. The slightly larger seed size of Andromeda is well suited to this market. Andromeda seeds contain 39% protein and 9% oil, both greater than narrow-leafed lupin and other pulse crops (Table 2). They have a lower alkaloid and crude fibre content than narrow-leafed lupins. For these reasons albus lupin is also a useful stockfeed. Albus and narrow-leafed lupins can be used as feed with equal success for all classes of livestock except pigs. Albus lupin is not recommended for use in pig diets because growth rates can be depressed. This is possibly caused by the relatively high content of oligosaccharides in the albus lupin grain that depresses voluntary food intake and growth rate. Table 2 Crude protein, oil and crude fibre in seeds of commonly grown legumes.